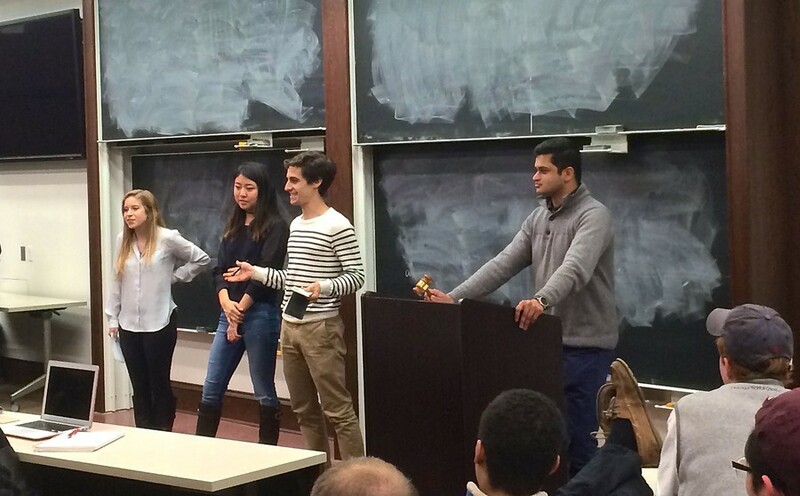 On Monday night, students gathered in Harper 130 for the annual Student Government candidates’ debate. The debate occurred ahead of the election, which lasts from Wednesday to Friday. Candidates for Executive Slate, undergraduate liaison to the Board of Trustees, graduate liaison to the Board of Trustees, and community and government liaison all participated in the debate, which covered the issues of divestment from fossil fuels, SG stipends, early selection of student government cabinets, and graduate student loan debt. During the debate, each candidate and slate introduced their platform, answered a series of pre-selected questions from the moderator, and then fielded moderated questions from the audience. For the Executive Slate portion of the debate, the Moose Party, composed of members of the Delta Upsilon (DU) fraternity, led a raucous supporting crowd of fraternity brothers as they leapt onto tables, hollered, and danced around. When asked about the legitimacy of pre-selecting cabinet members during the campaigning process, three slates (United Progress, The Very Good Slate, and ONE) criticized Open Minds for announcing their cabinet before the required Student Assembly approval process. Open Minds responded by claiming that ONE had done something similar on their website, and that the decision acknowledged the wisdom of pre-selecting a cabinet as a move towards transparency. ONE denied that claim. The event turned tense during the debate between Andrew Young and Anthony Downer, candidates for the undergraduate liaison to the Board of Trustees, when an audience member asked the question: “What are your reactions, if any, to the ‘Pay to Play’ article in The Maroon?” referring to a Viewpoints article that claimed Young had a financial advantage in the election. Young implied that Downer’s friendship with the writer of the article implicated him in its publication. Young also called the article’s accusations unfounded because both candidates had been given a stipend to fund their campaign. Downer responded that he had no involvement with the publication of the article and that, though he conceded that some of the accusations were unfounded, the article’s arguments about privilege in SG were still valid. The SG election will occur from Wednesday, April 29 through Friday, May 1.